Three years ago, Johann Van Helsing led the Rippers - an ancient organization dedicated to fighting evil - against the forces of the diabolical Cabal. At great cost to life, limb, and reason... they won. But in 1895 a new evil stirs in the dark of night, straining at the walls of its eternal prison. Its fiendish servants comb the globe, seeking a way to free their master and consume the world with shadows. Only the Rippers stand against them. But to triumph they must face their oldest nemeses... and their deepest fears! The Rippers Resurrected Game Master's Handbook contains everything a Game Master needs to run adventures in the Victorian era: expanded information about the Rippers' world, including secrets of the Cabal and other threats facing the Rippers, an adventure generator, the all-new Plot Point Campaign Return of Evil, a host of all-new Savage Tales, and stats for all the Rippers' steadfast allies and fiendish enemies. 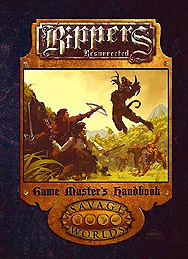 This book requires the Rippers Resurrected Player's Guide and the Savage Worlds core rules to play.